Fireproof wrapping surrounds the 150-gallon stripping still at Six Mile Creek Vineyard to contain the heat. The condenser is on the left. New York state enacted legislation in January 2013 to ease the requirements for production of distilled spirits on a small scale, or farm distillery basis. Yet prior to this legislation, a number of New York farm wineries already were licensed to produce distilled products from their grapes as part of their operations. Three such wineries from the Finger Lakes region of New York include Swedish Hill Vineyard, Rock Stream Vineyards and Six Mile Creek Vineyard. Swedish Hill Vineyard Romulus, N.Y.
Derek Wilber is the winemaker/distiller at Swedish Hill, where he has worked for 11 years. The winery was at the forefront of farm winery distillation in the Finger Lakes and purchased a pot still in 1994. Swedish Hill uses its distilled spirits in several dessert wines including Cynthia Marie Port; their sister facility, Goose Watch Winery, produces Classic Cream Sherry and Finale White Port. Additionally, they produce smaller amounts of an Eaux de Vie as well as Raspberry Infusion, a product made from fresh raspberries and Swedish Hill’s distilled grape brandy. The winery’s 600-liter alembic-style copper pot still was made in Portugal. Heated with LP gas, the still is surrounded by brick to maintain a constant temperature. Each batch contains 125 gallons of wine made from different varieties of grapes, although Wilber primarily uses white labrusca grapes such as Catawba and Niagara. The cost of grapes is relatively low, and Wilber likes the “nice high notes” of aromatics the native varieties add to the distillate. The craft beverage industry—wine, beer, cider and spirits—is booming across New York state. This article describes how three Finger Lakes wineries are riding that wave with a variety of distilled spirits. Swedish Hill Vineyard uses raspberries and brandy to make its Raspberry Infusion. Six Mile Creek Vineyard takes extracts of lemon, orange and almonds as the flavors for three liqueurs. Adding distilled spirits can give wineries more options to utilize raw materials. Distilling also offers another way to handle bumper crops that don’t quite measure up to expected quality standards. Distillation at Swedish Hill takes place outside, under the cover of a roof and adjacent to a pond that provides the cooling water for the condenser. Wilber said that he tries to distill when the air temperature is at least 65° F, noting that colder ambient temperatures adversely affect the character of the process. Swedish Hill usually distills in late spring and summer, following the vintage, necessitating the use of SO2. The wines typically have a pH of around 3.0 and, in order to ensure soundness, have free SO2 levels of 20-25 parts per million. The sulfur is removed by the approved addition of hydrogen peroxide on a lab bench just prior to distillation. Wine is added to the still the night before the process, and the burner is lit at around 6 a.m. It takes between two and three hours to reach distillation temperature, and each run takes five to six hours to complete. The first 3 to 5 gallons distilled (called “the heads”)are disposed of because of harsh aromatics and the possibility of contaminants such as methanol. Wilber then finishes the first distillation with no cuts (collecting in a separate vessel); the hearts (middle) and tails (end) of the process are combined as one base spirit. The cuts separating the hearts and tails of the spirit are made during the second distillation. This process remains the same regardless of the product’s intended use. The original 125 gallons of wine will yield about 25-30 gallons of spirits, with alcohol levels of about 40-50 proof. The process will be repeated until Wilber reaches the desired quantity. Because of the stability of the distillate, the second distillation might not occur for months or even a year. Storage takes place in 275-gallon stainless steel tanks. Wilber plans up to two years ahead in determining his distillation needs. He currently has about 1,400 gallons of sherry and 1,500 gallons of red port in barrel storage, and he plans to distill this year to add to his inventory. “When we come to the second distillation,” Wilber says, “it depends on what our end use will be.” For fortification spirits he will make only one cut of the hearts, and then the tails will be separated, carbon treated, filtered and distilled a third time. If the base wine used was relatively low in aromatics and phenolics, he can still use some of the tails in the fortification spirits. Wilber adds carbon powder to clean up the aromatics and, prior to the third distillation, runs the spirits through a 1-micron bag filter. When distilling for the Eaux de Vie, however, Swedish Hill only utilizes cuts of the hearts. As in the first distillation, the heads and tails will not be used. This will provide the cleanest aromatics, with the alcohol finishing at about 130 proof. Distilled water is then added to lower the alcohol to 80 proof for bottling. Wilber stressed that the only way to determine what cuts to make is to base the decision on aromatics and taste. Distilling numerous times with the same base wine allows him to have a good idea when the best quality spirits will be produced during the distilling process. Aromatic assessment at the still is done by cutting the spirits with equal amounts of distilled water in a series of glasses. The second distillation requires less time. Starting with spirits around 50 proof, distilling begins after 1-1.5 hours and finishes in about half the time as the first. Once the spirits are selected for the Eaux de Vie, they will be held for a minimum of a month to make sure everything is stable, and then bottled without any filtration. Wilber uses a GAI 16-spout filler with 375ml bottles, which are sealed with T-corks. Raspberry Infusion, the winery’s other distilled product, was made by dividing 3,500 pounds of red raspberries into two 1-ton grape bins and adding 60 gallons of their 140-proof brandy. A small amount of SO2 was added, and the mixture was punched down twice daily for about five days. It was then strained in one of Swedish Hill’s grape presses and went directly through diatomaceous earth filtration. It was filtered again through a pad filter, and the SO2 was adjusted prior to bottling. It has 18% alcohol by volume. The Raspberry Infusion and the Eaux de Vie constitute about 20% of Swedish Hill’s distilled spirits. The other 80% is used for the winery’s fortified wines, which are usually produced every other year. This year, Wilber expects to produce about 500 cases of sherry in 375ml bottles. Next year he will produce some 400 cases of Port-style red fortified wine in 750ml bottles and 250 cases of white Port-style wine in 375ml bottles. The fortified wines will come from Swedish Hill’s inventory, which currently includes 1,400 gallons of sherry and 1,600 gallons of red fortified wine, both aging in oak. New distilled wine will be added to the existing barrels to maintain a continuum of aging wines. Wilber said the sherry barrels include wine that was crushed as far back as 2003. Finally, Swedish Hill has a long-term program with about 12 barrels of grape brandy dating back to the late 1990s. The brandy is aging in a combination of old whiskey barrels and American oak wine barrels. The winery has not yet decided the fate of this brandy, but it is probably the oldest farm winery-produced brandy in New York state—and it might prove to be a historic product from the Finger Lakes. Rock Stream Vineyards Rock Stream, N.Y.
Mark Karasz is the owner, winemaker and distiller of Rock Stream Vineyards, a small winery a few miles north of Watkins Glen, N.Y. Originally from Long Island, Karasz knew land in the Finger Lakes would be less expensive than down state, so he purchased 150 acres on the west side of Seneca Lake. It came planted with some 40 acres of grapes (Concord, Niagara, Elvira and Aurora), which he currently sells, and Cayuga White, which he uses. He has added several acres of Vignoles and Traminette. The winery was founded in 2004. 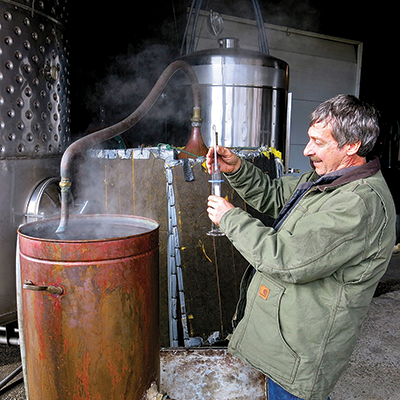 Karasz has an 80-gallon Alembic-style, copper pot still made in Portugal to produce two products: a grape brandy from wine and grappa from white wine skins (including Riesling, Cayuga White and Vignoles skins). His current grappa is from Vignoles, which he thinks offers the most aromatic characteristics. Each batch of brandy will consist of 55-60 gallons of Pinot Noir made from purchased grapes, with little free SO2. He heats the wine with a 150,000 BTU propane “lobster cooker,” as he calls it. It takes about two hours for the still to start producing spirits, and he will remove the first 3 to 5 liters of spirits, “the heads” that contain methanol and other impurities. He said that acetone and similar chemicals start to develop at 40°-50° C, and methanol at 60°-70° C.
When the distillate reaches 80°-95° C, Karasz begins collecting the hearts. Once that happens, he places cold, wet cloths around the lintel, or the “hat” of the condenser. He does this every 10 minutes to moderate the temperature during production of the hearts. One batch will generally provide about 6 gallons of hearts. As the distillation continues, the temperature increases, and Karasz begins to notice some cloudiness in the spirits, signifying the presence of fusel alcohols, known as “the tails.” At this point he stops the distillation run. He distills one time per batch and uses only the hearts, which yields an average of 6 gallons of distillate at 120 proof. He then lowers the alcohol level of the spirits to 80 proof by adding 3 gallons of distilled water to the 6 gallons of distillate, about 1 gallon at a time. After each addition and mixing in the water, he uses a hydrometer to measure the results. The dilution process usually takes two to three hours to complete. Karasz uses evOak oak chips from the Oak Solutions Group for his brandy. He places a pound of their medium-toast French oak chips in a mesh bag into small, 100-liter floating-lid tanks (purchased from Criveller) and lets it steep for 24 hours. He removes the chips and lets the distillate settle for a few days before filtering through a 0.6-micron absolute cartridge from Aftek. He then fills each bottle individually, using an Enolmatic single-bottle vacuum filler. The bottle is finished with a T-cork, label and capsule. Karasz feels that the brandy is ready for consumption immediately, but sometimes he will let the bottles sit a short while before selling them. Rock Stream’s other main distilled product is grappa. Karasz was introduced to this spirit while stationed with the U.S. Army in Italy for three years. All varieties used are estate-grown. After crushing and pressing the grapes, he places about 2 tons of skins into covered 1-ton grape bins and adds some tap water, cane sugar and yeast. He declined to identify his “recipe” for water and sugar, but he does use Lalvin 71B yeast. He treats the skin must much like a red wine, regularly punching it down to keep the must mixed. He allows about two weeks to complete fermentation but lets it take longer to complete, if necessary. The result is like a mash—firm enough to pick up with his hand, but still have liquid dripping out. Before loading the still, Karasz places a large, perforated disc in the bottom and then “shovels” the must into the still. He uses about 15 5-gallon buckets per still load. Karasz’s distillation process is the same as for brandy, but he noted that his quantity of hearts will be slightly less (about 5 gallons). “This stuff is really tricky on the tails. This is where you really have to taste and watch it carefully to make sure it doesn’t turn cloudy,” he said. Grappa distillate will tend to cloud with some impurities sooner—and more than regular brandy. Dilution with distilled water is the same, lowering the distillate to 80 proof. Karasz does not expose the grappa to oak, and he uses the same filtration and bottling protocol as with brandy. However, when using Vignoles, Karasz noted the slightest haze, so he used a 0.3-micron cartridge, which effectively cleared the haze. Karasz adds an interesting twist to marketing his grappa. He offers his customers a do-it-yourself oak option with the American Oak Infusion Spiral, produced by The Barrel Mill and made specifically for “aging” spirits in a single bottle. Karasz offers customers a taste of his grappa treated with oak for reference, then sells the spirals to customers for $5 apiece. Six Mile Creek Vineyard Ithaca, N.Y.
Paul King is the winemaker/distiller at Six Mile Creek Vineyard, located about 2 miles south of Ithaca. While working as an environmental biologist at Boyce Thompson Institute (associated with Cornell University) in 1989, King met the vineyard manager of Six Mile Creek, who asked him for help dealing with some diseases in the vineyard. King became interested, worked the 1989 crush there and stayed in contact with the winery. In 1999 he began working full-time at Six Mile Creek, assisting in the cellar, working in the vineyard and performing a variety of tasks common to workers at small wineries. Around 2003, the vineyard yielded a bumper crop of Seyval, and the winery’s owner, Roger Battistella, decided to purchase a still to use up the extra Seyval wine. The distillation equipment included a copper 150-gallon stripping still and 24-gallon copper Alembic-style pot still, both from Portugal. Currently King distills from estate-grown Seyval and/or Cayuga White wine, primarily fermented with Lalvin DV-10 yeast. The finished wine does not have any SO2 addition and can be distilled immediately after fermentation is complete. If any carbon dioxide is left in the young wine, it must be degassed prior to distillation. The Six Mile Creek Vineyard yields an averages of 3.5 to 5 tons of Seyval per acre, and King estimates that 160 gallons per ton of 11% alcohol Seyval wine (distilled three times for his vodka and gin) produce about 18 gallons of 80-proof spirits after dilution with distilled water. In the past, King has used one 1,600-gallon tank of Seyval wine for distillation, but due to increased demand, he may have to increase production and would purchase Seyval, if necessary. The first distillation takes place outside, under cover, with the 150-gallon still. A large propane burner heats the still, which is surrounded by a fireproof wrapping to keep the heat contained. Ethanol production begins at 76.4° C, with the methanol and other impurities developing at lower temperatures. This lower temperature distillation (the heads) is discarded. In the first distillation, he determines what is used for hearts and what is considered tails by temperature, an alcoholmeter and taste. The hearts and tails are kept separate, and the next distillation is done inside with the 24-gallon still. It also is heated by propane, and the resulting distillate drips from the attached condenser bathed in cold water. King utilizes sealed 55-gallon stainless steel drums to store the various batches of distillate until his third and final distillation takes place, which depends on production schedules at the winery. The vodka’s character and flavor is not affected by time. The grappa can change a small amount, but the gin changes the most. The gin is produced from the best parts of the second distillation, and eight or nine botanical components (his secret combination, including Italian botanicals favored by Battistella) are added to steep for two to three days before its third distillation. Once distillation is complete, the various products are stored in stainless barrels and bottled according to supply and demand. In addition to gin, vodka and grappa, King makes three liqueurs—Limoncella, Orangecello and Amore—made from lemon, orange and almond extracts, respectively. Production totals for the liqueurs were not available. None of these wineries depend on distilled products to power their businesses, but all find distillation provides them with opportunities to utilize raw materials in multiple ways. In an increasingly competitive market, it also allows them to offer their customers—especially those visiting their wineries—broader product lines. If recent wine production history here is any indication, the future will be bright, and glasses will be filled with many different tastes. Ray Pompilio is a wine writer based in Ithaca, N.Y., where he has close access to the largest concentration of wineries in the state.